Bobby Whiteside is the first academic educator to join the Hall of Fame. He taught at Texas State University for 33 years and directed the aquatic biology program for 18 years. 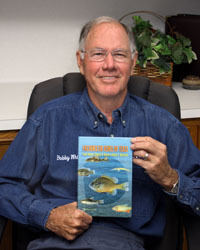 He co-wrote the book “Freshwater Fishes of Texas” in addition to penning 26 peer-reviewed publications and nine reports and book reviews. Many of his students work in fisheries management; water quality; and stream, river and reservoir management. Whiteside's passion for freshwater fishing is also illustrated by his 49-year membership in the Canyon Bass Club. He competed in state and regional tournaments and assisted with youth fishing, high school angling tournaments, and volunteer events that brought the sport of fishing to wounded soldiers, nursing home patients, and Boy Scout groups. He also worked with the club and other local partners to install fish habitat made of plastic and cedar trees into Canyon Lake and other area fisheries. In a groundbreaking public/private partnership, Gulf States Toyota has provided more than $2.5 million in funding to TPWD over the last 10 years to promote bass fishing and increase the participation of youth and families in freshwater fishing. 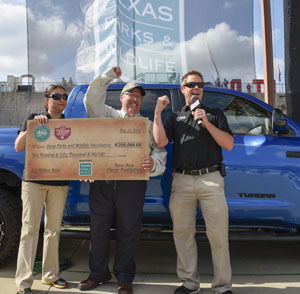 That contribution includes the creation and promotion of the Toyota Texas Bass Classic (TTBC), now called the Toyota Bassmaster Texas Fest, a professional bass fishing tournament that emphasizes best practices in fishing conservation. The TTBC, first held at Lake Fork in 2007, was the first tournament to implement the catch-weigh-and-immediate-release concept. Initiatives funded by proceeds from the event include the Neighborhood Fishin' Program, which stocks catchable-sized fish in urban community park ponds, and the State-Fish Art Contest, which uses art to interest youth in grades K-12 in fishing. Gulf States Toyota also provides significant funding to support the Toyota ShareLunker Program.